Déjà vu. Thanks to you! . . . Runnels voted best again! 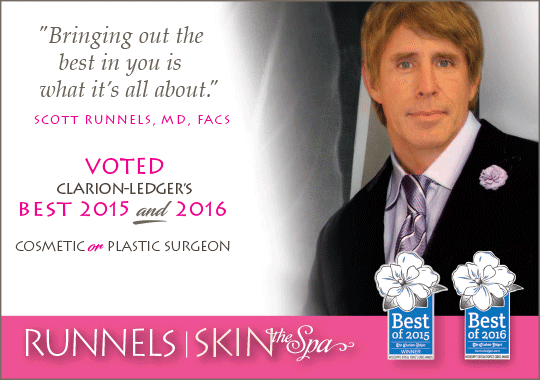 Did you know that Dr. Runnels was Voted The Clarion Ledger’s “Best Cosmetic or Plastic Surgeon” 2015 AND 2016? It's thanks to you! The best aesthetic surgeons perform to the highest standards and will take the time to listen to your every concern, answer all questions and discuss your options thoroughly. We think this describes Dr. Scott Runnels. And over 10,000 voters statewide agree. Dr. Runnels is dedicated to offering the very best in expertise and experience, as well as clinical care, all under one roof! Runnels offers the best medical grade products and latest procedures, such as Everlasting Brows, Kybella and the NEW Volbella treatments. They even offer a custom line of makeup! And remember experience matters. Dr. Runnels was the first plastic surgeon in Mississippi to receive the prestigious Diamond Level Certification from Allergan, representing the top 1% of plastic surgeons in the nation performing procedures with Botox, Juvéderm, Latisse and Natrelle breast implants.